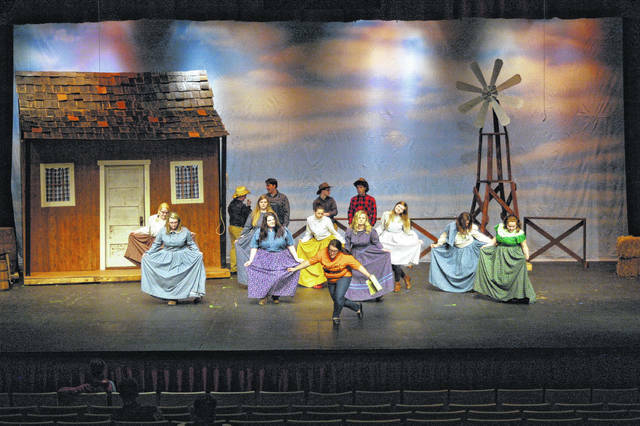 BIDWELL — River Valley students are hard at work preparing for the annual musical, which will take place this year on Friday, April 6 and Saturday, April 7 at 7 p.m. in the Berry Performing Arts Center on the University of Rio Grande campus. This year’s selection is the musical “Oklahoma!” by Oscar Hammerstein and Richard Rogers. The production is put on by students with the help of a few community members that volunteer their time. The cast, which is 40 strong is made up entirely of students who auditioned before Christmas break. Students and crew have been rehearsing and preparing for the full production that comes this weekend. “Students have put in a tremendous amount of rehearsal time to get to where we are today. Now is all the fun stuff; costumes, props, and of course the University of Rio Grande stage,” said Director Allyson Johnston. The benefits of participating in a production are numerous and dependent on what role the student plays in making it happen. According to Johnston, the greatest benefits aren’t always the skills necessary for singing and dancing. When talking to the students, a common theme becomes readily apparent; teamwork and the value of cooperation. Hannah Hawks is a senior playing Aunt Eller in the play. According to Hawks, team is the most valuable aspect. “Teamwork, knowing who is saying what and how to say it back, running lines a lot,” said Hawkes. Ian Eblin, who portrays Curly McLane loves seeing the whole production come together with all of the elements and small roles adding to the value of the whole production. Tickets are $10 for adults and $5 for students, and can be purchased online at rivervalley.ludus.com. According to Johnston, the production is only possible thanks to Ohio Valley Bank who sponsored the event.